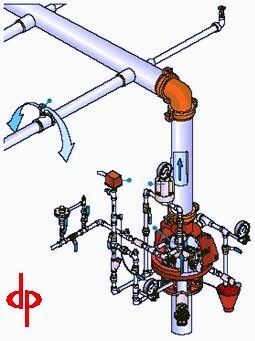 A wet pipe sprinkler system is a sprinkler system employing automatic sprinkler heads attached to a piping system containing water and connected to a water supply so that water discharges immediately from sprinklers opened by heat from a fire. piping system and out the opened sprinklers. A pre-action sprinkler system is similar to a deluge sprinkler system except the sprinklers are closed. This type system is typically used in areas containing high value equipment or contents and spaces which are highly sensitive to the effects of accidental sprinkler water discharge. The pre-action valve is normally closed and is operated by a separate detection system. 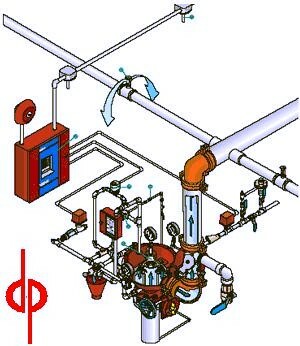 Activation of a fire detector will open the pre-action valve, allowing water to enter the system piping. Water will not flow from the sprinklers until heat activates the operating element in individual sprinklers. 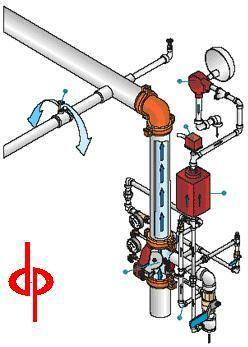 Opening of the pre-action valve effectively converts the system to a wet pipe sprinkler system. 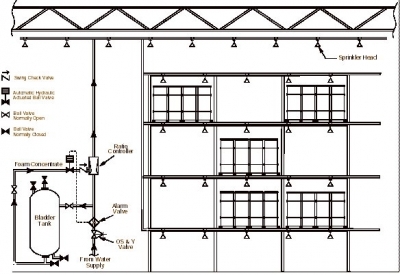 A deluge system is sprinkler system employing open sprinklers that are attached to a piping system that is connected to a water supply through a valve that is opened by the operation of a detection system installed in the same areas as the sprinklers. When this valve opens, water flows into the piping system and discharges from all the sprinklers attached thereto. 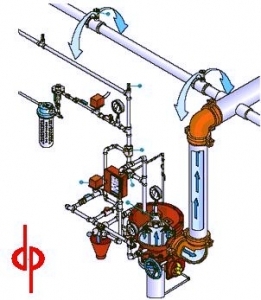 system that is pipe-connected to a source of foam concentrate and to a water supply. The system is equipped with appropriate discharge devices for extinguishing agent discharge and for distribution over the area to be protected. The piping system is connected to the water supply through a control valve that usually is actuated by operation of automatic detection equipment that is installed in the same areas as the sprinklers. When this valve opens, water flows into the piping system, foam concentrate is injected into the water, and the resulting foam solution discharging through the discharge devices generates and distributes foam. Upon exhaustion of the foam concentrate supply, water discharge follows and continues until shut off manually. Foam-water systems shall be of the wet pipe, dry pipe, deluge, or preaction type. Foam-water deluge systems are applicable to the protection of two-dimensional flammable liquid hazards.